Adele has been a youth services librarian in public libraries for 20 years. Why the Book “Middle School: The Worst Years of my Life”? The Middle School series by James Patterson and Chris Tebbets is a hit with kids. They feature likable and relateable characters, an engaging writing style, humor, heartfelt themes and lots of illustrations. 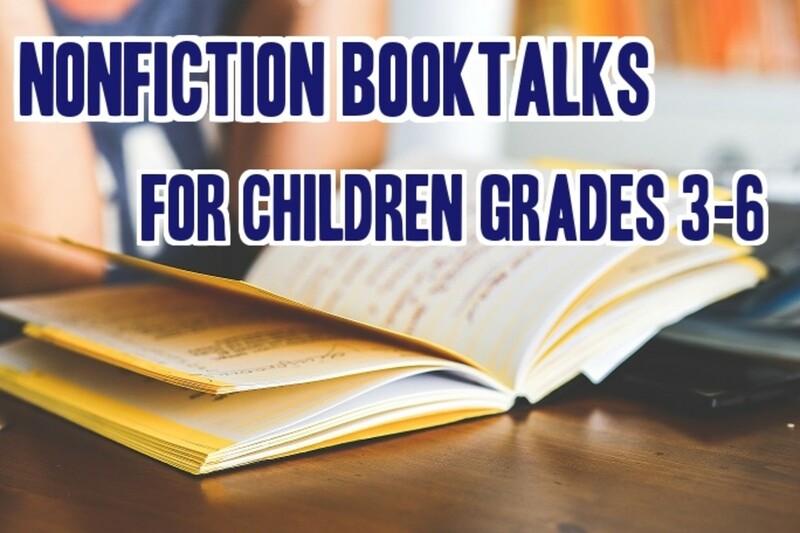 Children who were first pulled in by the Diary of a Wimpy Kid books will probably enjoy the stories, style and tone of Patterson and Tebbets’ chapter books as well. 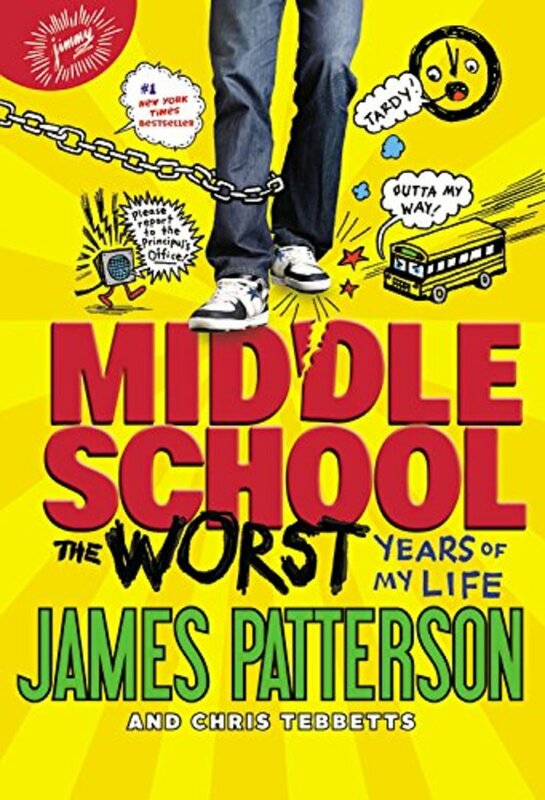 The first book, titled Middle School: The Worst Years of My Life has been turned into a movie and I’m guessing lots of book clubs, schools and libraries will be taking a look at this book and putting together games and activities for kids to get them interested in reading the books. If you haven’t read the book, I’ve included a summary at the bottom of this site. 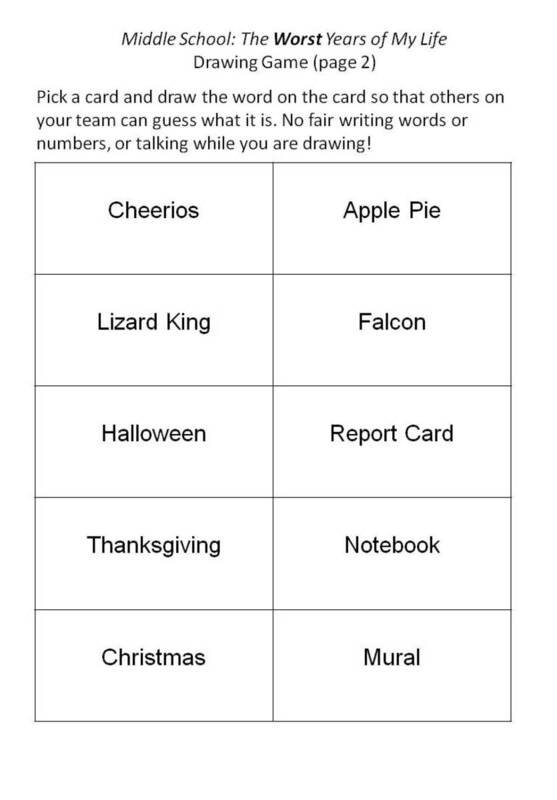 Right below, you will find 3 printable activities that are set to go. 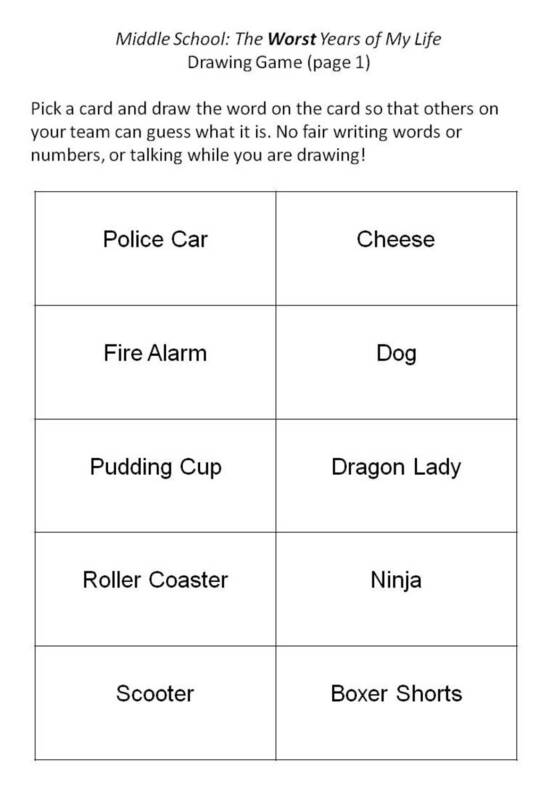 The first is a “name game” that serves as a good icebreaker for a book group or get-together. 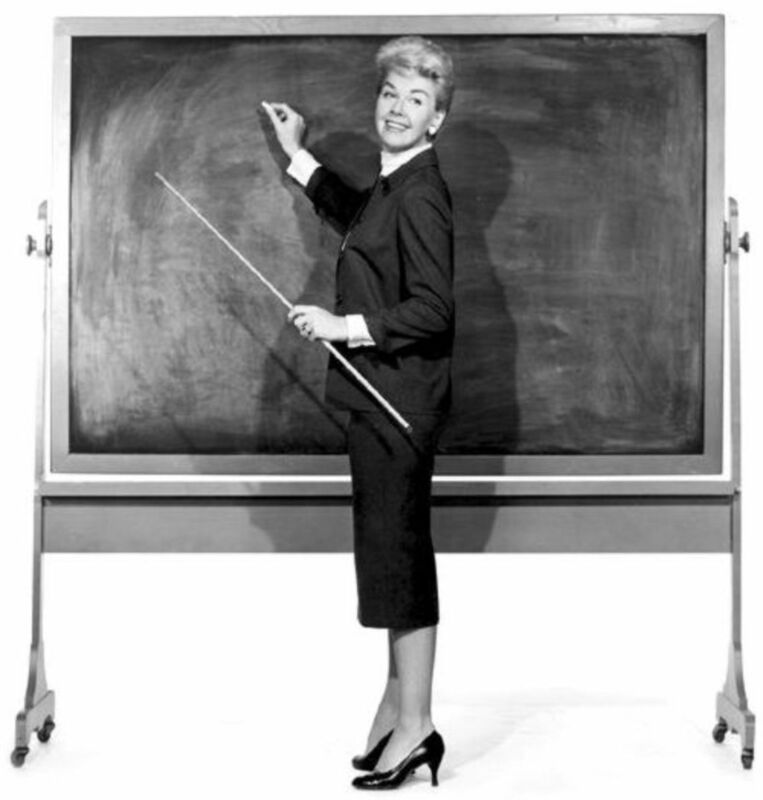 The second is a “drawing game” that works similar to how you would play the game Pictionary ®. 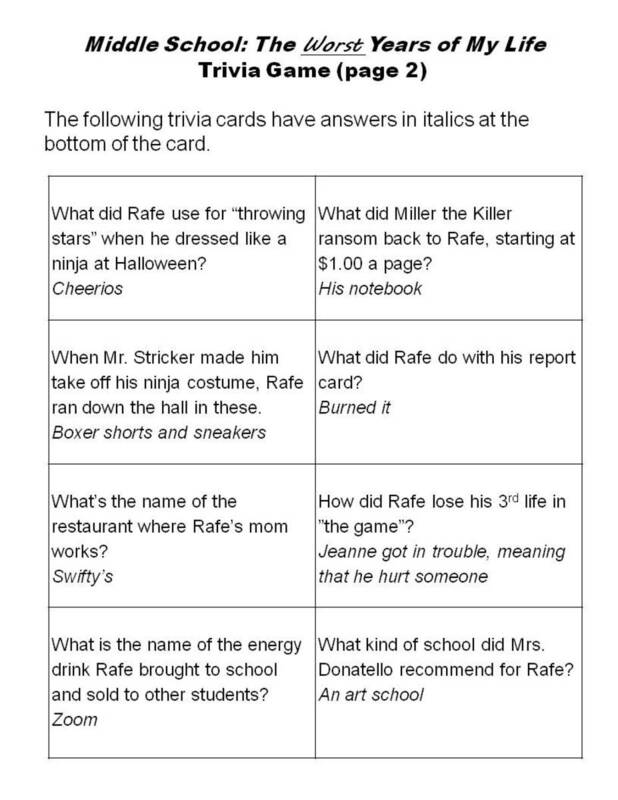 The third are trivia cards that you can print and use. 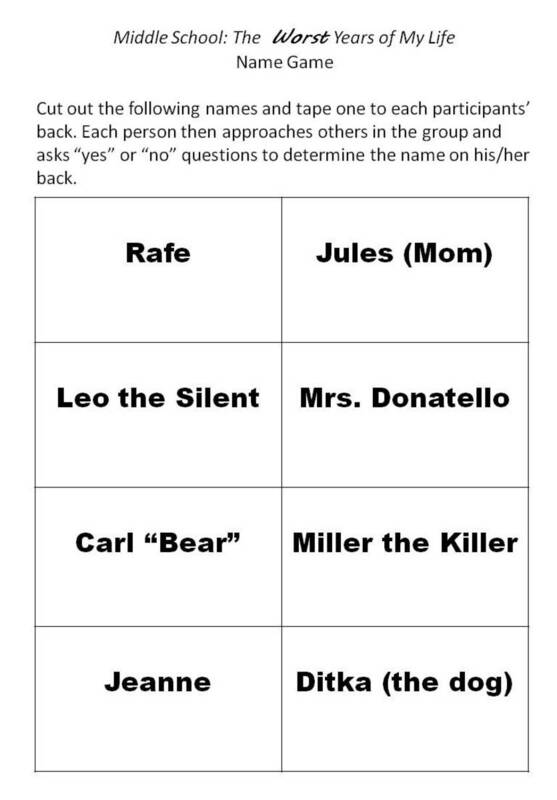 This activity serves as a good icebreaker and helps to remind the kids who the main characters in the book are. Print the following chart and cut along the lines to make name slips. Tape one slip to each child’s back and then have them try to figure out the name they were given by going around the room and asking “yes” or “no” questions. If you really want them to mix, tell them that they can only ask one question of each person. For the characters in this book, a good first question would be “Am I a kid or a grown-up?” If they found out they were a grown-up, they could then ask if they were a teacher, which would narrow down the field considerably. This game is played a lot like Pictionary. ® For this game, print the following sheet onto card stock, if you have it. Cut the cards apart, then place them face down on a stack. The first player picks up a card and draws what is named in the word on that card. The other children try to guess what the word is. The child who is making the drawing isn’t allowed to use symbols in the drawing or to say anything to the other children. You can divide the kids into teams and use a timer to give each child the same amount of time. Or, you can just have the first player draw until someone guesses it right. 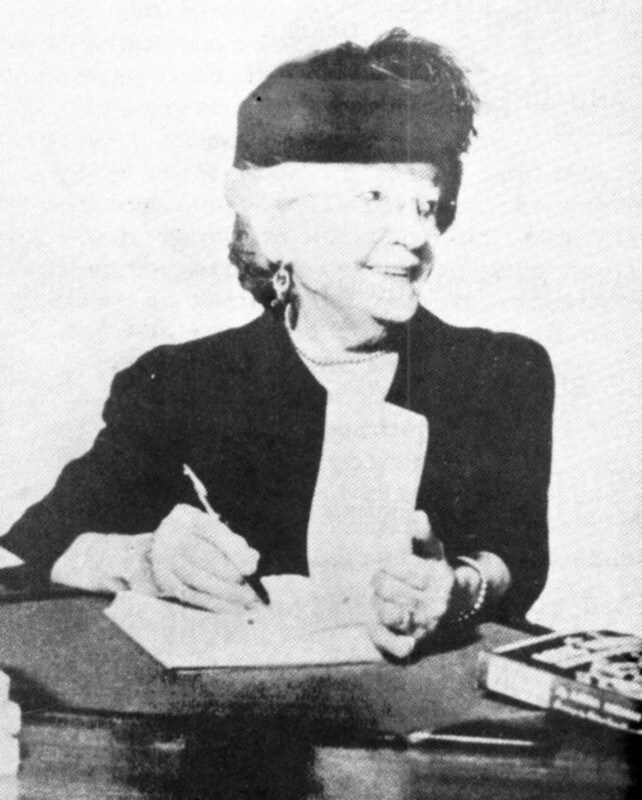 The person who got the correct guess then gets to draw a card and do the next drawing. 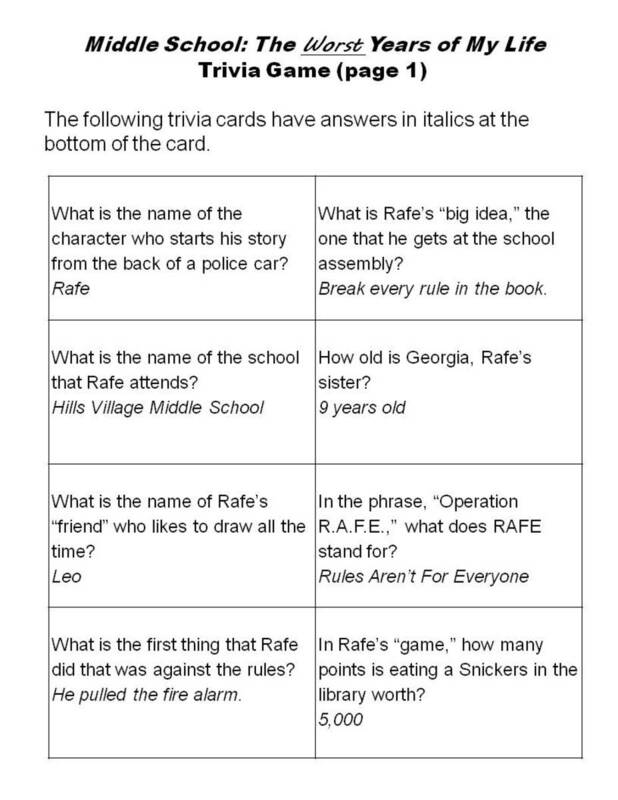 Here are some cards you can use to play a trivia game with the kids. Just print them out (card stock if you have it) and cut along the solid lines. You can divide them into teams and alternate cards. Another way I like to use them is to put the cards in a decorated box or fishbowl and have the children pull out a card. They are not to look at the card, but to give it to me. I then read them the question. If they are able to get 3 questions right, I give them a little prize like a bookmark. This method works especially well if you have several stations set up, and the children rotate from station to station. I have to admit, I wasn’t looking very much forward to reading Middle School the Worst Years of My Life when it first came out. I wasn’t convinced that the prolific adult author, James Patterson, could come up with something that would be interesting for kids. I’d seen other authors (cough cough John Grisham) who turned in less-than-riveting stories. My guess is that we can give Chris Tebbets quite a bit of credit for helping to craft an engaging story for children. So, here’s the story: Rafe Khatchadorian is bored almost to tears when the principal reads the rather lengthy rule book at the school assembly. Egged on by his friend Leo (a kid who hardly ever talks, but draws constantly) he comes up with the idea of breaking every rule in the book. Literally. Rafe plans to go through the book and find a way to disobey all 112 rules. Leo devises a point system and Rafe embarks on a kind of live-action video game which involved quite a bit of rule-breaking. Early on, he and Leo agree that he will go to extra lengths to make sure that no one else will get hurt. Some of the rules are pretty quick and easy: chewing gum, eating a Snickers ® in the library. They aren’t worth many points. Others are harder to get away with—like pulling the fire alarm. Of course, Rafe runs in to quite a bit of trouble along the way, and when it gets bad enough to stress out his mother, he has to figure out what kind of person he wants to be. We readers get the sense that up to this point, Rafe has basically been a good kid that didn’t cause much trouble, and we wonder what drives him to the excitement of seeing he can break every rule. Well, the answer to that question brings us to a couple of SPOILER ALERTS. Don’t read any further if you don’t want to find out about some major twists in the plot. This book has a deeper, poignant side which is revealed in a couple of plot twists. First, we find out that Rafe’s friend Leo is actually an imaginary friend. We discover that we have a bit of a troubled kid on our hands, one who feels the need to escape to a fantasy world. His mother is saddened by his continuing engagement with the “friend,” but also a little wistful, too. The live-in boyfriend, Carl, is a lout of a man who ridicules Rafe for holding onto an imaginary friend from childhood. And though this book shares quite a few things that make the “Diary of a Wimpy Kid” books so popular—humor and an emphasis on humorous illustrations—it also deals with some tough issues. 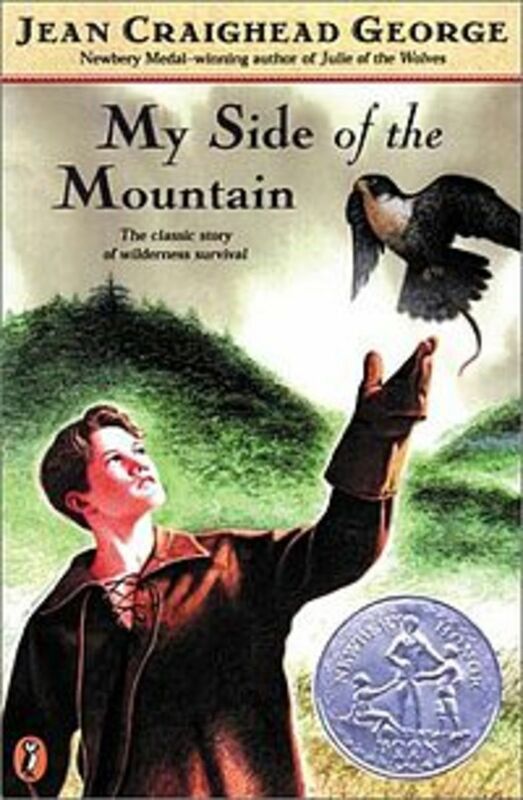 Rafe isn’t merely a slacker; he’s a kid who is dealing with some hard things. I don’t want anyone to get the impression that this is a somber book. I would still classify it as humor. I would just say there is a bit of an edge to it, a sense that a boy is working his way through problems that seem too big for him. And, without giving away any more of the end, I’ll say that he does find a way out and on to a better future. 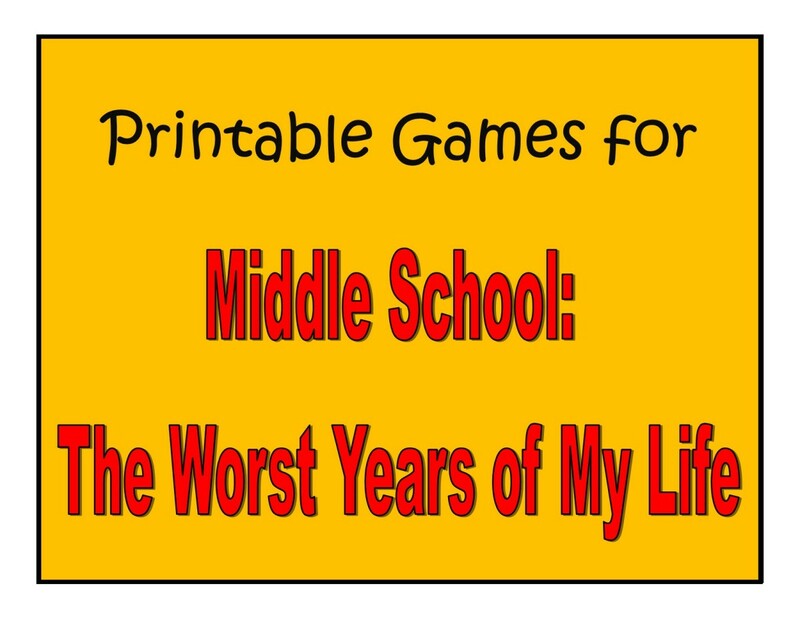 What are your ideas for activities for the book "Middle School: The Worst Years of My Life"?